I have seen people through various forums/blogs getting confused : how to configure DNS server in child domain for Parent’s domain name resolutions? The confusion is, should it point to itself for DNS server address or parent DNS server for name resolution of parent & child domain both? In order to make the life easier & remove the confusion, i thought of coming up with the article on my blog. Firstly, understand that DNS is the backbone of AD & most of the issues we face in our environment is because of the improper configuration of DNS server. In few posts, i saw people using Public IP as the DNS address or ISP’s DNS address directly configured into their servers/domain systems NIC for preferred DNS server address, which is absolutely wrong & the reason is, when DNS lookup is performed against the local resource records in the domain, first it queries local host file in your system located in inside “etc” folder, if it can’t locate anything configured there, it looks for preferred DNS server IP in NIC. If NIC’s preferred DNS address is configured with public IP or ISP’s IP, it will forward the query directly to that public IP for local domain name resolution & the query will be performed, before it is says request timed-out. The reason is that, your local domain & its records exists in your local DNS server. How a DNS server hosted outside your domain can even come to know existent of any such private domain without any record in its DNS server? From security perspective, its a big passage for attacker to penetrate your infrastructure & attack your network for access. Public DNS server’s IP has to be configured into Forwarder Tab of your local DNS server. If you have multiple DNS server running in your domain, configure all of the local DNS server forwarder to have this Public DNS IP address, but make sure you obtain this public DNS server address from your ISP & you are not using anything like 4.2.2.2 or 2.2.2.2/8.8.8.8, since these are not the authoritative DNS server for your domain through which query has to pass for name resolution. The query for external domain name resolution has to pass through your ISP’s DNS server. Using 4.2.2.2 or any other public IP directly in your DC/servers as a preferred DNS or alternate DNS server is going to pose a security threat for the environment. Question: How do I set up DNS for a child domain? Answer: To set up DNS for a child domain, create a delegation record on the parent DNS server for the child DNS server. Create a secondary zone on the child DNS server that transfers the parent zone from the parent DNS server. Note Windows Server 2003 has additional types of zones, such as Stub Zones and forest-level integrated Active Directory zones, that may be a better fit for your environment. Set the child domain controller to point to itself first. 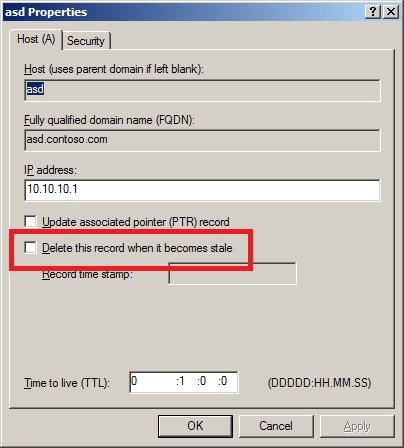 As soon as an additional domain controller is available, set the child domain controller to point to this domain controller in the child domain as its secondary. Note: Ignore the version of OS, its applicable for all the windows OS as concept for DNS has not been changed. Many forum/post, often i see a question, how to configure DNS in my domain controller, is primary point to itself or secondary DNS server, is it OK to configure loopback IP & what are the best practices etc. NEVER use public IP configured directly in the NIC either of the DC or clients. Public IP(ISP DNS) used for external domain name resolution,should always be configured in Forwarder of DNS servers. NedPyle from Microsoft has got recommended & best practices for DNS. So next time you aare confused or looking for best practices follow the below link.